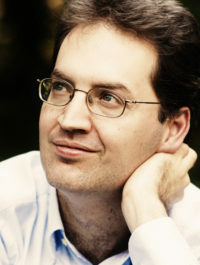 His sensational technique, deep musicality, wide range of interest have made Dénes Várjon one of the most exciting and highly regarded participants of international musical life. He is a universal musician: excellent soloist, first-class chamber musician, artistic leader of festivals, highly sought–after piano pedagogue. Widely considered as one of the greatest chamber musicians, he works regularly with pre-eminent partners such as Steven Isserlis, Tabea Zimmermann, Kim Kashkashian, Jörg Widmann, Leonidas Kavakos, András Schiff , Heinz Holliger, Miklós Perényi, Joshua Bell. As a soloist he is a welcome guest at major concert series, from New York’s Carnegie Hall to Vienna’s Konzerthaus and London’s Wigmore Hall. He also performs frequently with his wife Izabella Simon playing four hands and two pianos recitals together. In the past decade they organized and led several chamber music festivals, the most recent one being „kamara.hu” at the Franz Liszt Music Academy in Budapest. He has recorded for the Naxos, Capriccio and Hungaroton labels with critical acclaim. In 2015 he recorded the Schumann piano concerto with the WDR Symphonieorchester and Heinz Holliger, and all five Beethoven piano concertos with Concerto Budapest and András Keller. Dénes Várjon graduated from the Franz Liszt Music Academy. He won first prize at the Piano Competition of Hungarian Radio, at the Leó Weiner Chamber Music Competition in Budapest and at the Géza Anda Competition in Zurich. He was awarded with the Liszt, with the Sándor Veress and with the Bartók-Pásztory Prize. Mr. Várjon works also for Henle’s Urtext Editions.